MOUNTAIN OF FIRE AND MIRACLES MINISTRIES International Headquarters, Lagos, Nigeria. 5. Any power assigned to puncture the plan of God for my life, I puncture your power and bury you now, in Jesus’ name. 40. 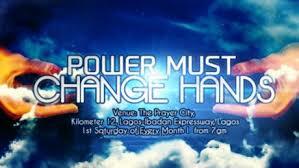 Every power, using hands to cover my blessings, scatter, in the name of Jesus.